La Traviata - Opera in three acts (1992 Remastered Version), Act I: Che è ciò? La Traviata - Opera in three acts (1992 Remastered Version), Act I: È strano! È strano! La Traviata - Opera in three acts (1992 Remastered Version), Act II: Alfredo! Voi! 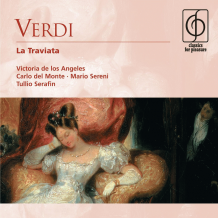 La Traviata - Opera in three acts (1992 Remastered Version), Act II: Di Sprezzo degno! La Traviata - Opera in three acts (1992 Remastered Version), Act III: Annina? Comandate?